Industrial Automation 2.0: How Machine learning & AI are changing the game. Industrial automation is not a new term, everybody is already aware how various industries are being benefitted by automation; but now we can say that it’s the start of Industrial automation 2.0; imagine how would it really look like, when the industrial pieces of equipment know as to when they will break down or are able to fine-tune to avoid damage and continue to work or if they can identify defective parts and repair them by calling off a technician? Considering the evolution of new computing technologies and artificial intelligence, Industrial automation 2.0 isn’t just a buzzword. Instead, we are in the phase wherein the computers now learn from experiences as an alternative to programming the computers so that they understand what needs to be done. This learning experience of computers is popularly known as “machine learning”, a breakthrough in computing technology. Machine learning is not new, but definitely has achieved impetus because of its ability to make use of available data, adapt from previous technologies and delivering steadfast results. The big data analytics, data mining and their implementation had added more to the machine learning technology. To understand the concept, let’s take an example from the daily life. As an internet user, while browsing you must have come across product recommendations from Amazon or fraud detection pop up that appears on the screen. These are the basic machine learning application. Machine learning is a kind of artificial intelligence application that enables computers to learn without any explicit programming. These applications create a system that assists in analyzing complex data on a large scale, allow organizations to avoid unfamiliar risks and recognize beneficial opportunities. Machine learning is a combination of basic and advanced algorithms, assembly modeling, mechanization and iterative process and data research abilities that takes systems beyond the common applications such as informed diagnostics in healthcare, trading and fraud detection in the financial sector or working as per consumer behavior in retail. With this machine learning is now finding its way to the manufacturing domain, to assist in increased and efficient production and operation within the industrial unit. For the manufacturing industries to stay competitive with other domains there is a serious need for them to come out of their legacy systems by automating their traditional processes. Every manufacturer needs to have the potential of implementing machine learning applications in order to achieve predictive accuracy in production. So far, manufacturing and industrial automation units have been slow in adapting machine learning at their facilities. The growing changes in consumer behavior in regards to customization and product quality, it is difficult for the manufacturers to make changes in the production system (like re-programming or re-tooling the application) in short time. This is where the machine learning benefits the manufacturers. The machine learning application examines and performs maintenance on production apparatus, optimizes the production & supply chain efficiency by reprogramming the unit computers and assist in delivering products on-time. 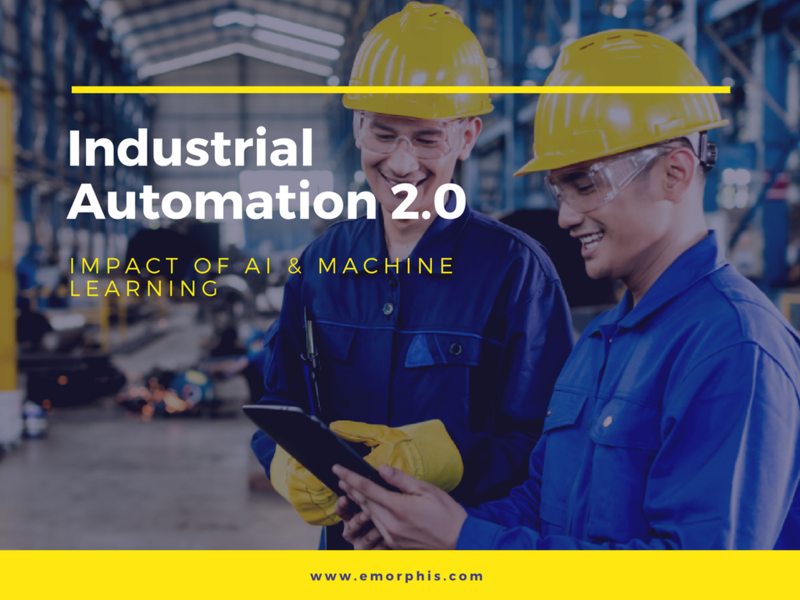 Many known manufacturing companies have utilized various forms of machine learning applications in their manufacturing and industrial automation facility and have achieved positive business outcomes. One such manufacturing facility is of Siemens’; that is using neural networks and open IoT systems to collaborate their design, manufacturing, production, supply chain and distribution teams into one scalable system. Increased production volume: Manufacturing units can leverage machine learning and data analytics for their process improvements. These systems assist in predicting yield rates at various levels of supply chain thereby minimizing the cost of raw material and shielding brand quality. Comprehensive quality data can reduce rework and improve operational efficiency leading to manufacturing sustainability. Prediction based production capacity allow sustainable and profitable packaging. Machine learning tools optimize scheduling, operator productivity and help in gaining production visibility. Asset Performance Management: The AI application provides real-time operational intelligence which backs product management lifecycle which includes process integration, automation and collaboration insights, monitoring and diagnostics. Engineering and Finance Data Optimization: Manufacturing industries do not have interlinked IT systems and thus it gets difficult for multiple teams to collaborate on a particular project. The machine learning solution provides appropriate data for factory and demand-side management. The data provide insights into production workflows, expenses, work-in-progress and inventory optimization, determines on time customization and delivery to fulfill demand with lower cost. Improved repair, maintenance, and overhaul performance: By integrating machine learning application, database and programs on a single cloud platform help manufacturing staff to access business processes and details of service and maintenance of industrial equipment. This connected architecture assists in seamless communication between Intelligent System service agent, local technician and remote servicing expert. One of the finest examples of IoT service architecture being used is integrated with Microsoft Azure for better performance. Enable better conditioned monitoring: The machine learning analytics improves the production process and equipment effectiveness by integrating sensor data on machines. Some of the operating parameters include oil pressure, temperature, air pressure etc. These parameters help in detecting quality and performance, identifying bottlenecks and the probability of equipment failure. Innovating and enhancing product /service quality: This is one of the major challenges of any manufacturing unit- quality. Implementing machine learning at industrial automation units determines the factors that impact the product quality. Machine learning is definitely a revolution in manufacturing and industrial automation and is certainly making a difference. The manufacturers, who aim towards customized production and to promote manufacturing-as-a-service, are turning to machine learning to select better machinery, training of the manufacturing staff, vendors and suppliers, optimize pricing and improving sales strategies. Machine learning is considered as an uprising phase in supply chain business intelligence. Though the implementation had been slow over the last few years as it calls for a huge cost and time, the new data infrastructure would undeniably occupy a place in supply chain process. Emorphis is a leading Consulting & Software Development Partner with a vision of empowering enterprises in executing their businesses dreams & strategies in the digital era. We are not just a technology company but an end-to-end solution provider specialized in Data Science, Internet of Things, Cloud Infrastructure Management & Digital Services Implementation. With our high spirit of innovation, passion & dedication; we have been able to transform enterprises to upswing & leap into a new world with fast, secured, intelligent, automated & scalable solutions. We are 7 years young but have immense experience that we are nurturing various businesses by offering solutions in niche world like Blockchain, IoT, Artificial Intelligence, Augmented Reality, Virtual Reality, etc.